Poets see the eyes as a window on the soul. Scientists increasingly view the eyes as a window to the inner workings of the body. Researchers at Western University in London, Ontario have found that early vision loss in mice helps anticipate and predict age-related diseases that typically appear much later in life. For an aging population facing vision-related diseases like macular degeneration and glaucoma, that’s good news. If the retinal cells are lost, you can’t treat them,” says Kathleen Allen Hill, Associate Professor for Western’s Department of Biology. “But we’ve learned that eye function in mice starts to deteriorate before the structure does. That means there may be a therapeutic window of opportunity where we can treat cells to compensate for their inability to function properly." What’s also intriguing about the research is the ability to use the eye as a window on the brain to learn about age-associated neurodegenerative diseases, like Parkinson’s and Alzheimer’s. With these diseases, the progressive death of nerve cells causes problems with movement or mental functioning. “Our research is an important first step in understanding neurodegenerative diseases and developing a framework for diagnostic and intervention strategies,” Hill says. Electroretinography reveals functional deficits before neurons in the retina are lost. Mitochondria are tiny packages of enzymes that make the energy to power cells in every part of the body. When they fail due to genetic or environmental factors, less energy is generated within the cell, which can lead to cell death and even organ failure. “Retinal cells require lots of energy, for both their basic function and to constantly rebuild the underlying structure,” explains Hill. “The cells are like a factory going all out, all the time." What happens when there’s not enough energy to power both types of production? Enter the harlequin mouse, which scientists discovered has a mutation that makes this mouse helpfully mimic the signs of aging in the human eye. Hill’s research team looked at the role mitochondrial dysfunction played in the function and structure of the mouse retina. The mice did not show any one specific human disease; they simply reached a point where they couldn’t produce enough energy for the retinal cells to function properly. Instead of going full out, the cell “factory” faltered, contributing to premature aging and progressive neuron loss leading to blindness. A geneticist by training, Hill appreciates that her research team was a truly collaborative effort. The team included scientists and students, specialists in ophthalmology, physiology, applied math, physics, metabolism and structural engineering. The team also received key support from Dr. Cindy Hutnik, Associate Professor, Departments of Ophthalmology and Pathology at Western. 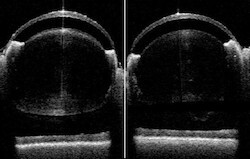 Whole eye imaging provides a noninvasive window into structural integrity or structural losses. State-of-the-art equipment helped the team use non-invasive imaging tests over the lifespan of the mice. A human eye model created with 3D printing also helped test drug flow through the eye. “The retina is like a multi-layered cake,” Hill explains. “All the layers have to be a particular shape, size and thickness for it to function properly. The imaging equipment is so sophisticated that we can measure the layers and see if they are thinning or not developing properly over time. The features of the electroretinogram map to specific cells in the retina. As a child, Hill joined her father in helping with activities at Lions Manor, a complex in Windsor designed for blind and senior citizens. “I learned a lot from the people who were adapting to change in their eyesight in this supportive community, and that has stayed with me,” she says. Something she finds fascinating about her research is the potential of monitoring retinal cells to make sure that other treatments, such as chemotherapy, don’t compromise a healthy eye. People with inherited genetic deficiencies and other disorders could also benefit from the research.